The Chanel Haute Couture show happened yesterday in Paris. 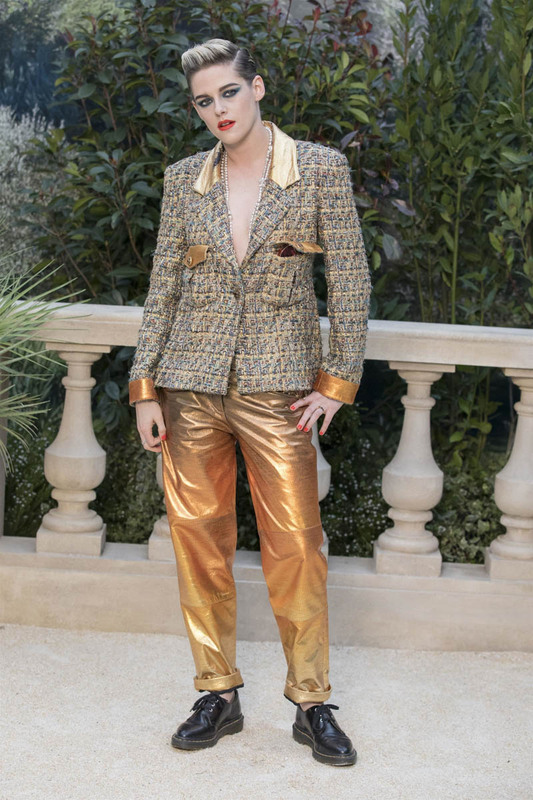 Kristen Stewart, one of the brand’s ambassadors, was there and for the first time in a long time, I’m not super excited about her in the clothes. And it’s not the clothes themselves – I quite like this combination – but the fit of them on her. It’s the oversizing of both the jacket and the pants, maybe? Like perhaps it should have been one or the other? Also the rolling of the pants seems unpolished here, in that material. And while I will always f-ck with an oxford, here, in combination with all of the rest of it, I don’t think it’s working. As we’ve seen on red carpets and in editorial lately, heavy 80s makeup is the trend. And not heavy in like the Kardashian way, with all that contouring, but heavy in the eyes, bright colours, clashing lips, blush bombs all over the cheeks. 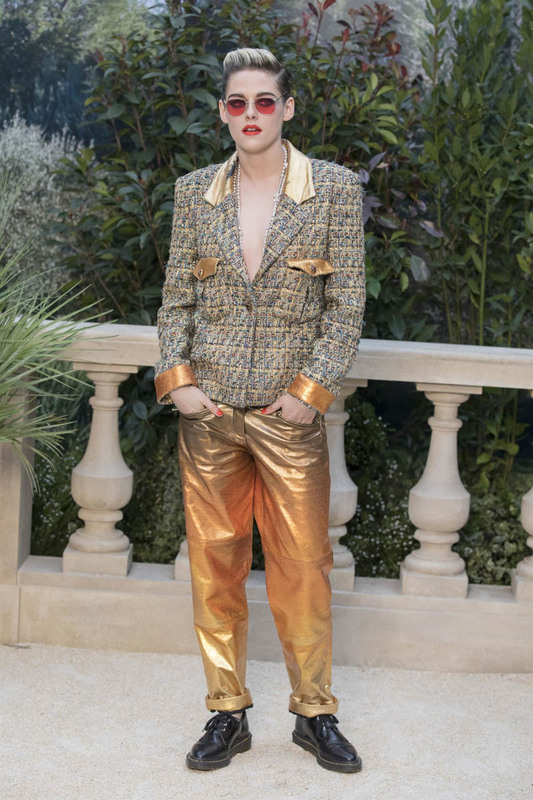 Kristen’s makeup matched the makeup that was shown on the runway so this is part of the vibe of the collection and I don’t hate it for that, because, look, this is what fashion week is for – imagination, creativity, experimenting. Saying that it’s not “pretty” or that it’s over-the-top or “too much” is f-cking beside the point at these kinds of events. The point is to take away certain elements for every day. Like this crazy blush. I might try it. Also at Chanel – Tessa Thompson in white, with the handbag around her neck. Are you in? It’s definitely a look and I love it, on the runway. It becomes less of a bag than an accessory, a supersized necklace. That said, maybe only she could pull it off. After all, she’s Tessa Thompson. At her first ever Chanel couture show. Which was not a small deal for her, as she told W yesterday when they were invited to join her as she prepped for the event to talk about her personal style, how she builds her looks, where she shops, and what clothes mean to her. Oh? You mean clothes mean something? My favourite thing that she said, or didn’t say, is where in LA she shops vintage because she didn’t want other people going there. Ha. I feel the same, not with vintage but with certain products, certain websites. It’s so selfish, I know. But sometimes that sh-t is so special you don’t want to share! It’s sickly sweet to the point of being obnoxious, especially in pink, but those extra large cap sleeves, that’s my sh-t, right there, and pairing it with the booties instead of a standard heel takes away some of the twee. Princessing is the style theme so far this year. You might as well push it to its extreme point so that it almost develops an edge. Imagine that one on Nicole Kidman. Nicole would know how to wear the sh-t out if it.